Fall has descended upon our beautiful Portland metro area, and as the leaves turn unimaginable colors of red, yellow and gold, harvest is wrapping up at area farms, gardens and pumpkin patches. With fall, also comes the magical time of Halloween with its costumes, candy and of course the jackolantern that is the carved pumpkin! Since Portland has such a rich tradition of celebrating with harvest and Halloween decorations, we decided to hunt down some of the best examples of jack o’lanterns. Though you’ve likely already completed your pumpkin carvings, we think this will give you some new inspiration for next year, as well as a new appreciation for pumpkin carving in Portland. In our hunt to find some of the most impressive pumpkin carvings, we came across those that were artistic, a few that were fun, but several that were just simply amazing! Which do you find to be the most inspiring for your own pumpkin carving session? Surprisingly, our search found more than a few amazing pumpkins from Portland and/or Oregon carvers that caught our attention. Which of these do you think is the best? We found this Star Wars pumpkin carving right here in Oregon. Back in 2013, some of Denise Alvarez’s pumpkin artwork was featured in a piece done by the Oregonian. Denise, a Beaverton native explained how she got started and how she makes her pumpkin carvings happen! 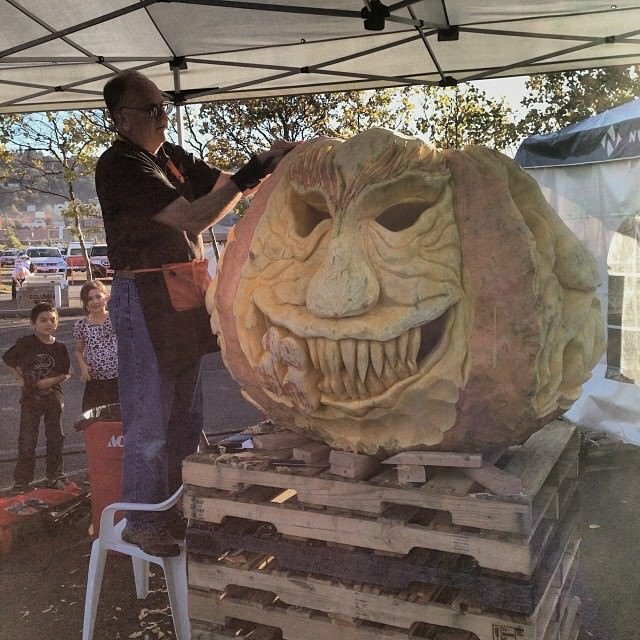 This massive creation was done at the 2013 Hood River Harvest Fest. We are not sure how big it actually is, but it sure got our attention. Have you ever seen such a massive pumpkin carving? If you love the Portland Trailblazers, this might just be the pumpkin carving for you. This perfect Portland Halloween pumpkin carving was captured by jstrategy some time ago. But it is still pretty impressive! We did our best to find the details about this one, but wasn’t able to find the story or creator. If you’re a U of O fan, we’d venture to guess that this might be one of the best Oregon jack o’lanterns you’ve come across yet. Nothing says Portland Oregon like the Made in Oregon sign downtown. Now if you are able to get it on your pumpkin, then you’ve got something pretty amazing. This was created by Jonathan H. Liu back in 2006. He has some pretty amazing pieces he has done over the years, but the Oregon theme really stood out to us. Well we know we called this amazing Portland pumpkin carvings, but during our research we also came across a few amazing artists who do not live here. Rather than exclude them from the post, we included them at the end. We think you will be glad we did! If extreme pumpkin carvings are what you are aspiring to, you need to check out the work done by Clive Cooper. His pumpkin art is some of the most extreme pumpkin art we came across and we think you will agree that it is truly impressive! You can see more of his recent carvings here. Who would have thought that there would be a company that just does pumpkin carvings. Leave it to the big apple and you end up with Maniac Pumpkin Carvers. This is what they do! Some of their work will leave you speechless, some will give you chills. In the end, it is some of the most amazing pumpkin artistry we have ever seen. Villafane Studios is a group of artists that make what you and I do with pumpkins seem like child’s play. If you’ve never seen their work, we urge you to check them out. Though some of our Oregon pumpkin carving artists are really amazing, there is a level of artistry to carving pumpkins that we really didn’t know existed. Hopefully you can appreciate these amazing pumpkin works of art as we did.